A Pittsburgh real estate developer with aspirations of becoming mayor finds himself at odds with his wife and his business partner after encountering a couple of guys from his old neighborhood who bring him closer to his own history and the roots of his community. This is a story about the quest for success, what is legal, what is fair and ultimately, what is right and what is wrong. These concepts are not just black and white. They are usually very muddy and predicated on each individual’s point-of-view. On some level this story tries to indicate that there is a clear distinction. Perhaps more importantly, the pivotal character, Harmond Wilks (Allen Gilmore), finds what is true for him. At the end of the day this is a story of self-discovery. As I have come to expect from the Court Theatre, this production was top notch and spot-on at every level. The dialogue was well paced and well modulated, with a rise and fall appropriate to the changing emotions creating enough contrast to give full meaning to the ending crescendo. .The one-location set by Jack Magaw with lighting by Claire Chrzan is a real estate office in a tattered storefront that is a shadow of its former self. Large windows look out onto the street so we can see actors as they enter and exit. A nice touch are the windows on the outside façade, showing the adjoining apartments softly lit and offering a peek inside that give a broader yet subtle sense of the urban context. Gilmore as Harmond Wilks gets little rest. He is busy in every scene as his character deals with the challenges presented by his business and his political aspirations as well as the present realities and recollections of his family life. James Vincent Meredith does a great job as Wilks’ golf-obsessed partner, Roosevelt Hicks. The role requires a range of emotions as Hicks is at various times convivial, charming, abrasive, authoritative, vulnerable and down-right nasty. Ann Joseph as Harmond’s wife and campaign promoter Mame, provides a softer side to this male dominated cast but she is still no shrinking violet. She is a woman with a plan, personal ambition and a life of her own. The role of Sterling Johnson played by James T. Alfred is a kind of street philosopher slash psychologist in the guise of “handyman” who is “his own union.” It is Sterling who unnerves Harmond’s conscience. Alfred H. Wilson is Elder Joseph Barlow a/k/a “Old Joe.” There was not a minute that I did not believe I was hearing Old Joe’s story from Joe himself. Wilson imbues the performance with just enough humor to make Joe enjoyable as a sympathetic though somewhat manipulating presence. The conflict in this drama centers on the ownership status of Old Joe’s house and how that will affect the neighborhood development plans Harmond and Roosevelt have in the works. Aided by Sterling, the facts ultimately challenge the goals of Mame, Roosevelt, and of course, Harmond. 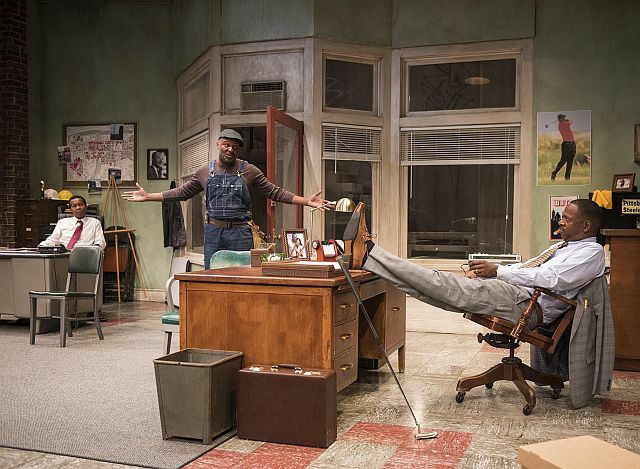 This is just great theater skillfully written by August Wilson, a Pittsburgh native who is a master of believable dialogue, produced by a talented cast and production staff led by Artistic Director Charles Newell and Executive Director Angel Ysaguirre.. You can’t get much better than this. DETAILS: “Radio Golf” is at Court Theatre, 5535 S. Ellis Ave. , through runs Sept. 30, 2018. For tickets and other information call (773) 753-4472 or visit Court Theatre.